>> Download it in pdf. In this court case “preservation of forests” was assumed to challenge tribal forest rights. (4) Yet, because tribals are only 9 % of India’s population and still about 60 % of India’s biodiverse forests have survived in areas where tribals live, they have managed better than others to save biodiverse forest by adapting their life to its regeneration. Forest dwellers’ rights to continue to do so have to be respected to preserve biodiverse forest – as required also by India’s treaty obligations on biodiversity. (5) As such customary rights to their forest-based lives “could not be recorded” earlier and the customary nature and extent of these rights are thus “not adequately recognized” yet (6), the FRA provides that their forest community’s village council, “the Gram Sabha shall be the authority to initiate the process for determining the nature and extent” of rights “by receiving claims, consolidating and verifying them” (7) as long as the customary nature and extent of all forest rights have got fully recorded. – While ordering millions of FRA forest rights claimants to be evicted, the Supreme Court did not clarify even which law would require such claimants of rejected forest right claims to be evicted but wondered still 2 weeks later “under which provision of law the eviction has to be made” (18) – as if ‘the eviction has to be made’ even without clarity which law would require it ! – As the FRA forest rights claimants can not be thus evicted if not “otherwise provided” by law (21), their forced eviction is not provided by law, because the only other provision on eviction of FRA claimants which could allow curtailment of forest rights says they could be legally removed only from “critical wildlife habitats” and even then not by force but only with their “free informed consent” on resettlement. (22) As the evictions ordered now by the Supreme Court are not evictions from such “inviolate”, criticalwildlife habitats and do not have affected forest communities’ consent to such resettlement of their rights, they are not based on adequate legal premises on evicting FRA forest rights claimants. And as people’s ‘free informed consent’ is required even for their removal from such ‘inviolate areas’, all the more so for their removal from less inviolate areas. -“ensure that the habitat of […] forest dwellers is preserved” from any problematic “practices affecting their cultural and natural heritage” and “to protect wildlife, forest and biodiversity” (25) and community life adapted to forest regeneration. – “regulate access to community forest resources and stop any activity which adversely affects” them (26) “ensuring that the prior informed consent or approval and involvement of indigenous and local communities is obtained for access to genetic resources where they have” this “established right” to regulate “access to such resources” (27) under the FRA. Thus all claim modifications, rejections and their reasons which were not informed to the claimants and Gram Sabha in time to enable their petitions, remain invalid and have to be reviewed (33) respecting Gram Sabha’s constitutional “power to prevent alienation of land” in forest community and “restore any unlawfully alienated land”. 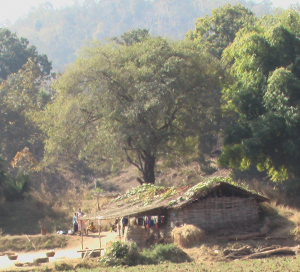 (34) On rejected claims, Gram Sabha is the authority to determine in the claimed area whether the claimant may have still other rights to claim (35) or lives in customary community habitat – or how to prevent problems in area’s life such as villagers’ alienation from forests which sustains them. – FRA requires “granting a secure and inalienable right to those communities whose right to life depends on right to forests and thereby strengthening the entire conservation regime” “while ensuring livelihood and food security” of community, living as “integral to the very survival and sustainability of the forest ecosystems” by its “symbiotic relationship with the entire ecosystem”, like the Supreme Court in 2013 ruled. (38) If such forest dwellers are by forced eviction alienated from forests on which their life depends, their inalienable rights are violated – which a lack of registration can not justify. – As registered property status is “prohibited ground of discrimination”, human rights like “access to water”, secure food, tenure, home, living conditions or “protection from forced eviction, should not be made conditional on a person’s land tenure status” or determined by “whether an individual lives or is registered” in formal or “informal settlement, is internally displaced or leads a nomadic lifestyle”. (39) Rejected registration can not thus justify forced eviction. – While tribal forest dwellers are less than 9 % of India’s popolation but about 40 % of those who have been for ‘development’ in India, forcibly evicted, displaced from their homes and their sources of food and subsistence, they already suffer also by global standards most disproportionately from forced evictions, from consequent tenure and food insecurity and from children’s malnutrition-caused stunting and wasting. (45) This results also from discrimination against the equal rights of cultures and life-heritages of non-registered land use and tenure, which have often sustained biodiverse forests. Such forced evictions of ca.30 million tribals even after 1947 belong to what the FRA observes as ‘historical injustice’ which it has to correct. 4. These legal conditions were not respected as Supreme Court on 13/2 ordered millions of people to be forcibly evicted (56) but could not show – even 2 weeks after ordering states to evict millions of people – which law would require such claimants of rejected FRA forest right claims to be thus evicted (57) or how would the legal protection of their human rights be secured. >>> Download it in pdf. 2. The Supreme Court of India order on 13-02-2019, Record of Proceedings, Writ Petition(s)(Civil) No(s). 109/2008 Wildlife First & ors. Versus Ministry of Forest and Environment & ors. 3. The Supreme Court of India order on 28-02-2019, Record of Proceedings, Writ Petition(s)(Civil) No(s). 109/2008 Wildlife First & ors. Versus Ministry of Forest and Environment & ors. 4. The Supreme Court of India order on 13-02-2019, Record of Proceedings, Writ Petition(s)(Civil) No(s). 109/2008 Wildlife First & ors. Versus Ministry of Forest and Environment & ors. 5. UN Convention on Biological Diversity (CBD), articles 8(j) and 10 (c), FAO Plant Treaty articles 5.1 c-d, 6.2 d-f and 9.1-9.2 and Nagoya Protocol, articles 6.2 and 12.4. 8. The Supreme Court of India order on 13-02-2019, Record of Proceedings, Writ Petition(s)(Civil) No(s). 109/2008 Wildlife First & ors. Versus Ministry of Forest and Environment & ors. 14. The Supreme Court of India order on 28-02-2019, Record of Proceedings, Writ Petition(s)(Civil) No(s). 109/2008 Wildlife First & ors. Versus Ministry of Forest and Environment & ors. 18. The Supreme Court of India order on 28-02-2019, Record of Proceedings, Writ Petition(s)(Civil) No(s). 109/2008 Wildlife First & ors. versus Ministry of Forest and Environment & ors. 19. The Supreme Court of India order on 13-02-2019, Record of Proceedings, Writ Petition(s)(Civil) No(s). 109/2008 Wildlife First & ors. Versus Ministry of Forest and Environment & ors. 20. The Supreme Court of India order on 28-02-2019, Record of Proceedings, Writ Petition(s)(Civil) No(s). 109/2008 Wildlife First & ors. versus Ministry of Forest and Environment & ors. 23. The Supreme Court of India order on 28-02-2019, Record of Proceedings, Writ Petition(s)(Civil) No(s). 109/2008 Wildlife First & ors. versus Ministry of Forest and Environment & ors. 29. Even if titles on CFR or other traditional rights on customary community habitat are not yet approved, they may still be eligibly claimable and the authority to decide if anything have to be removed from community’s area may belong to the Gram Sabha. 51. The Supreme Court of India, Judgement on Niyamgiri (Orissa Mining Corporation vs.MoEF & others), 18.4.2013, sections 41-42 and 49, guideline (v) (a) corresponding to Government of India Ministry of Tribal Affairs, Forest Rights Act 2006, Act, Rules and Guidelines, Guidelines on the implementation of the FRA; (https://tribal.nic.in/FRA/data/FRARulesBook.pdf ) The free, prior and informed consent of the people and communities would be required also in respect to the lands and forests of their life-heritage which they have traditionally used, as shown for example by CESCR General comment 21, paragraphs 36-37, 49 (d) and 55 (e) and “Indigenous peoples shall not be forcibly removed from their lands or territories […] without the free, prior and informed consent of the […] peoples concerned” as they”have the right to determine and develop priorities and strategies for the development or use of” the lands and forests they have traditionally used. (UNDRIP articles 10 and 32.1) “States must refrain from introducing any deliberately retrogressive measures with respect to de jure or de facto protection against forced evictions.” (UN Basic Principles and Guidelines on Development-Based Evictions and Displacement, A/HRC/4/18, paragr. 17-18, 21) See also CESCR General comment 7: The right to adequate housing: Forced evictions, paragraphs 13 & 16. 56. The Supreme Court of India order on 13-02-2019, Record of Proceedings, Writ Petition(s)(Civil) No(s). 109/2008 Wildlife First & ors. versus Ministry of Forest and Environment & ors. 57. The Supreme Court of India order on 28-02-2019, Record of Proceedings, Writ Petition(s)(Civil) No(s). 109/2008 Wildlife First & ors. versus Ministry of Forest and Environment & ors. 58. See for example E/C.12/IND/CO/5 8 August 2008 paragraphs 28, 31, 44 and 71 and CERD/C/IND/CO/19, 5 May 2007, paragraph 20, and A/HRC/WG.6/13/IND/2, paragraph 68, see also 56 and 65 and UN High Commissioner for Human Rights: “Let us ensure that development for some is not to the detriment of the human rights of others” and A/HRC/34/51/Add.1, Report of the Special Rapporteur on adequate housing as a component of the right to an adequate standard of living, and on the right to non-discrimination in this context, on her mission to India, 10 January 2017, paragraph 47-49, 69-70 and A/73/176 The Report of the Special Rapporteur on the rights of indigenous peoples to the General Assembly, paragraphs 59-60, 85 and 93 and A/HRC/39/17, The Report of the Special Rapporteur on the rights of indigenous peoples, paragraphs 32 and 63.